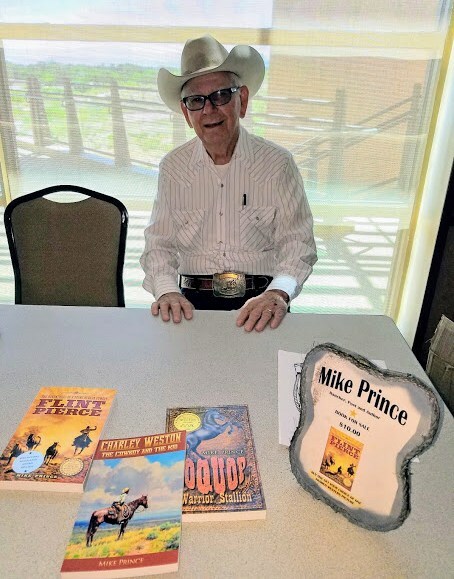 After a distinguished career as an engineer with the Hughes Corporation and a middle school teacher and coach, Mike Prince Sr. of Alamo is a published author. In early April this year, Prince was invited to be one of the guest speakers and do a book signing at the monthly meeting of the Las Vegas Historical Society. Prince is also a known author of cowboy poetry and said he read some of his poems to the delight of the audience. He has three books in print at the present time. His first, Toquop, the Warrior Stallion, won the Academy of Western Artists Will Rogers Gold Medallion in 2008. His second and third books are Flint Pierce, The Adventures of a Young Nevada Cowboy (2013), and Charley Weston, the Cowboy and the Kid (2017). He is currently working on a fourth book which picks up the story of Flint Pierce a little later in his life. Prince says he is considering doing a follow up with the Charley Weston character as well. In his stories, he says he often weaves in secondary characters, both men and women, who are based in part on real people he has known at one time or another.